Welcome to Fish Window Cleaning of Portland, Milwaukie, Lake Oswego, West Linn, Tigard, Tualatin, Oregon City, Wilsonville, Sherwood, Canby, and Happy Valley, OR! We are your local residential and commercial window cleaning company for Portland, Milwaukie, Lake Oswego, West Linn, Tigard, Tualatin, Oregon City, Wilsonville, Sherwood, Canby, and Happy Valley. We understand that the appearance of your home is important to you. It's important to us too! That's why you can trust us to leave your house looking the exact same as it did before we came in - except for your sparkling, clean windows! Our team wears fresh, red shoe covers and uses absorbent cloth pads under your windows to protect your carpet or wood floors. We work quickly and quietly to cause the least amount of disruption so you can relax while we take care of the hard work. We clean all types of interior and exterior windows but we also clean gutters, chandeliers, ceiling fans, and more! 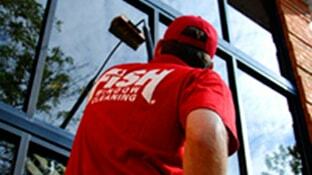 As the largest window cleaning company in the world, we understand the needs of businesses. We can help brighten your office, restaurant, showroom, lobby, and more! We can customize our programs to meet your needs, your budget, and your schedule, offering cleanings ranging from weekly to annually. Let our licensed, bonded, and insured team of professionals take care of making your windows and doors spotless.